In the name of enhancing security and protecting the welfare of their citizens, the majority of government have taken action that can be considered intrusive. Surveillance from definition is the act where the acts of an individual, group or body are scrutinized and observed by an external body in an effort of monitoring their activities. Democracy dictates that the needs of the people are adhered to, and all decision are not to be done or implemented impromptu without the consent of the people. However, the case has not been so during the implementation of surveillance and monitoring. From my opinion, I believe this act as dictated and implemented by the government jeopardizes the rule of law and democracy. In a democratic nation, all individuals are entitled to the right to privacy. Surveillance by the government is an act that overlooks this right as the privacy of individuals is no longer paramount, and the security concerns are prioritized. With the increase in modern forms of communication and interaction, there lacks a proper definition of what an individual’s privacy entails and as such it is not well stipulated in constitutions. 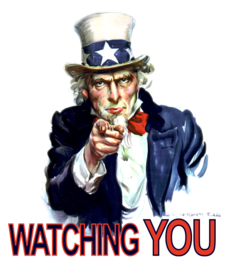 Most governments use this an excuse to monitor the activities of their citizens.